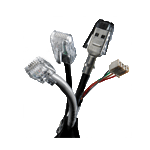 The DirectPRO™ Interface is a hardwired solution that is compatible with a variety of host devices listed in the APG connectivity guide. APG Cash Drawer offers a wide array of purpose-built cash drawer solutions tailored to the CDKO ports commonly found in POS receipt printers and cash register systems. 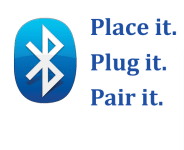 The APG MUL (Multivoltage) Interface is designed to take a cash drawer and connect, via a variety of interchangeable cables, POS receipt printers and terminals. 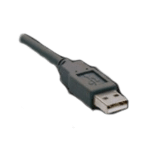 The detachable RJ45 cable can be changed on-site allowing cash drawers fitted with the MUL interface to adapt to a different terminal or printer. Connect your cash drawer through a variety of interchangeable cables to receipt printers and POS terminals using the MultiPRO® Interface. Available for: Series 100, Series 4,000, Vasario™ Cash Drawers, Stratis™ Cash Drawers, and POS-Podium™. 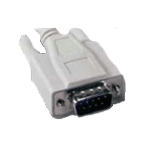 The SerialPRO® Interface integrates with the model 484A Cash Drawer and provides a convenient, cost-effective solution for the RS232 serial COM port. A PERFORMANCE INTEGRATION SOLUTION — Want to transition to a tablet-based POS system for conducting mobile transactions? Transform the retail stores’ front end with a modern, integrated POS solution where transactions are seamless and peripheral cables are hidden from sight. 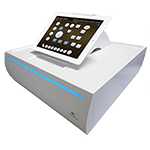 The Stratis™ Integration System includes a tablet holder and cash drawer which can integrate easily into a retailer’s cloud-based environment. The TabletPRO™ Model 550 Cash Drawer for iPad® provides a simple, cost-effective cash drawer for an Apple iPad® tablet. 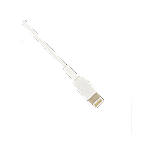 Connected by wire to the iPad®‘s Lightning® jack, the retailer’s app can quickly connect to and use the cash drawer. The Model 554A/854 Cash Drawers provide a convenient, cost-effective solution for the USB port.